The Black Friday sale at Gymboree is live! What makes this sale especially good is that you can stack a Gymboree 20% off coupon on top of the doorbuster prices and the % off everything. That means you will be able to get big savings! These are some of the best prices you will see at Gymboree all year! Plus free shipping with no minimum and no coupon code required! Items will get picked over so I would shop today. You can get pajamas for just $8 with coupon and graphic tees for just $6.40 with the coupon! Even if you don’t have a coupon these are great deals. Where can you get a Gymboree 20% off coupon? These coupons are available in select magazines or if you are a member of their rewards program they also send them to your home or email. They are also in the Parents Magazine and Family Fun November issues. Gymboree Free Shipping With No Minimum Plus Up to 80% off! Plus if you happen to have a Gymboree coupon you can stack that on top of the sale AND Gymboree free shipping. That means HUGE savings with no shipping costs! Plus you can stack with your 20% off coupon too! Don’t have a coupon, I am giving three Gymboree coupons away on my facebook page. All pajamas are marked down to just $15 and if you have a coupon they will be just $12. This is a great tome to grab some super cute holiday pjs! There is a great Gymboree Veterans Day Sale going on right now with amazing prices on clothing. Plus if you happen to have a Gymboree coupon you can stack that on top of these great sale prices! 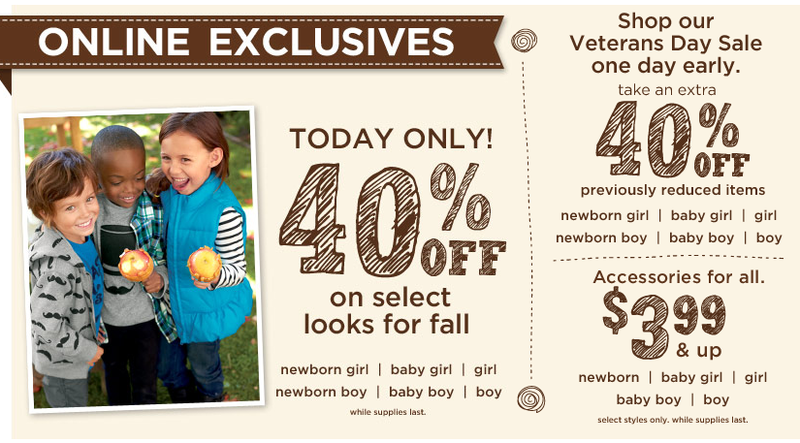 Gymboree Sales – Up to 40% off Entire Purchase with Gymboree Veterans Day Sale. Plus there are Gymboree Jingle Deals this week as well and $15 sleepwear! Items are marked down with all these sales so you can stack a 20% off Gymboree coupon on top of these great prices. Gymboree coupons are available in select magazines or you may have received a coupon in the mail recently. Here is an amazing deal on Gymboree. Everything is marked down 30% plus you can stack the coupon code WEBDEAL20 for an additional 20% off today only! This is the best deal I have seen on Gymboree in a long time. If you are spending $75 or more you will automatically get free shipping. If you are a Gymboree fan, be sure to check out this article on where to find gymboree coupons. Gymbucks is also going on right now so for for every $50 spent in a single transaction (not including purchases of gift cards/certificates) at gymboree.com, U.S. Gymboree stores and Gymboree Outlet you will receive $25 worth of Gymbucks. You can then redeem these Gymbucks from April 11, 2013 (12:00 AM ET) – April 21, 2013 (11:59 PM ET) at Gymboree retail stores, gymboree.com and Gymboree Outlet. You can redeem $25 off a $50 merchandise purchase during the redemption period. 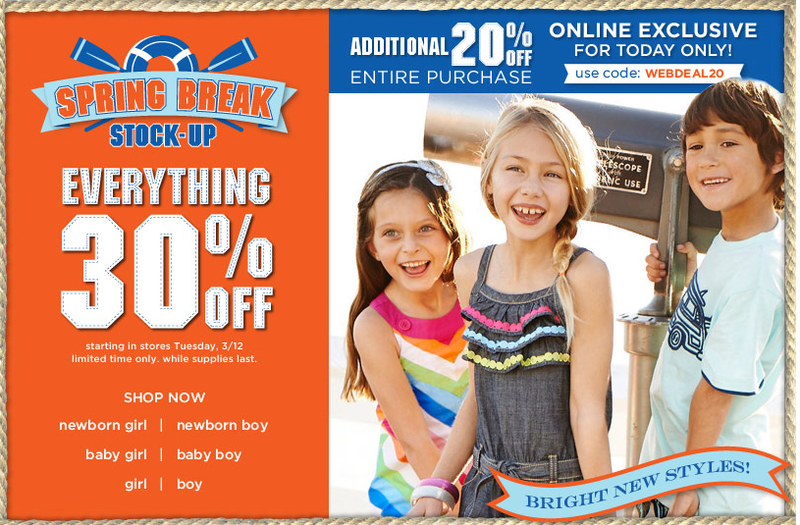 Shop Gymboree Spring Break Sale Today! !